The thing about St. John is that you not only have to ask the right person, you have to ask the right question. 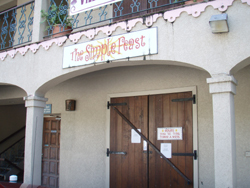 Try as we might, we can’t get a straight answer about the fate of Simple Feast. Mostly we hear “don’t know “, but we also hear it’ll reopen as a mini Office Depot kind of place or a mini Costco kind of place or a gourmet wine and foods kind of place. Bottom line is that it’s closed and has been since August and it will reopen when it reopens. 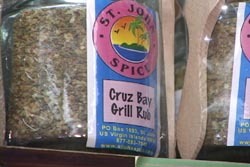 Hot sauces, coffees and teas, spices, and of course Cruz Bay Grill Rub fill the shelves at St. John Spice. (And so do T-shirts, hats, coasters, CDs, cookbooks, pirate flags and even lip balm.) But part of the draw to this Cruz Bay institution is also the proprietors. In On-StJohn’s first video interview, we talk with Ruth Ernst about the business, where those spices come from, why she likes being an ambassador to St. John’s constant flow of dedicated visitors, and who the heck Blind Betty is. But no, she didn’t tell us what’s in that grill rub. (I still think it’s weed.) Watch the interview here! Granted, the closest I’ve been to Italy is Dean and Deluca, but last I checked, pizza and pasta was Italian. So a recent Tradewinds article puzzled me. It is about a new restaurant opening above the new Infusions martini lounge in Cruz Bay and the article says it will fill a void because the island is lacking when it comes to authentic Italian cuisine. That leaves the Texaco station as the only place to buy gas on the Cruz Bay side, along with the other gas station in Coral Bay. The Texaco station can get a bit crazy, but it’s not like there are Carter-era gas lines. A little patience, and you get your turn. Regular unleaded is about $3.60 per gallon right now. Always amazing how fast you can burn through a tank or two of gas on a 20 square mile island. With a For Sale sign already up in front of their home, one local family resorted to putting their children on the street to sell fruit from their trees. 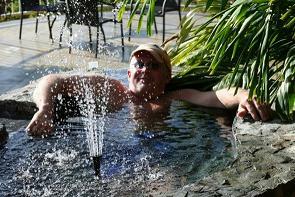 Another act of desperation as taxes, utilities and spiraling real estate costs continue to force long-time locals out. This is actually a couple of kids at the end of their driveway on Rock Ridge Road selling lemons. Six lemons for 2 bucks. Clever kids. They truncated Lemonade Stand into Lemon Stand, eliminating the huge overhead costs of labor and paper cups. (Okay, okay. Cute picture and a funny headline. But check out this story that was in Sunday’s New York Times. Now THAT was a show! Okay, get on the phone and book your villa for next New Year’s Eve. (Not mine. We’ll be there for sure.) The New Year’s Eve fireworks show was spectacular. The show was staged at the Westin, started promptly at midnight, and lasted 15 minutes. Another, equally good show in Red Hook lasted about five minutes longer. Seriously, put it on your list of something you’d like to do. Fireworks over water on a nearly full moon night is something pretty cool. Look for a place to see next year’s show somewhere from the Estate Lindholm area to, oh, say, Hart Bay or so. Say hello to our newest advertiser. Ocean Runner rents power boats out of Cruz Bay. They’re just down the beach from the Beach Bar, and if you’re willing to spend a little money, this is a great way to spend a day. Particularly if you’re looking for a way to get to places like Jost van Dyke or one of the other British Virgin Islands, or if you’re a diver. This isn’t a cheap day. By the time you tip the Captain (if you hire one, and you don’t have to if you have power boating skills) and pay for the fuel, you could spend $600. That said, go with a group, and share the expense. 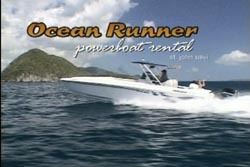 Watch Ocean Runner’s new On St. John ad!